Developer Studio offers a selection of graphical development tools for building web-based reporting applications. These tools can be accessed from the Projects on localhost folder for local development and deployment to the web. A subset of the tools can also be accessed from the WebFOCUS Environments folder for development or editing directly on the Reporting Server and the web server. Below are some of the tasks and tools that you can use in Developer Studio. The Project Wizard, which you can access only from the Projects area, creates an application control file and defines search paths for additional project resources. For more information, see Project Wizard. Synonym Editor. Provides a graphical interface that enables you to view and modify existing synonyms. For more information, see Synonym Editor. Create Synonym Tool. Creates synonyms on the Reporting Server if they do not already exist. For more information, see Create Synonym Tool. You can also create synonyms using the Server Console. For details, see the Describing Data With Graphical Tools manual. Synonym Wizard. Creates synonyms for a z/OS platform. For details, see the Describing Data With Graphical Tools manual. Upload Data File Utility. Allows you to create a WebFOCUS Master File and data file from a local file, such as Excel or CSV file and continue to create reports using WebFOCUS reporting tools. Procedure Viewer. A graphical presentation of components that make up a procedure. Component Connector Menu. Displays available procedure components and provides access to graphical tools, such as the text editor which you can use to create components. For more information, see Component Connector Toolbar. Report Painter. Creates complex, styled reports in a graphical representation of the report page. For more information, see Report Painter. SQL Report Wizard. Assists you with SQL passthru which allows you to execute SQL code that retrieves data from an RDBMS. For more information, see SQL Report Wizard. Text Editor. Enables administrators to create, view, and edit source code for procedures. For more information, see Text Editor. Define Tool. Creates virtual fields that are evaluated before the report is executed. For more information, see Define Tool. Join Tool. Defines a relationship between two or more data sources so that a report can use data from all of them at once. For more information, see Join Tool. Define Function Wizard. Assists in creating user functions. Once created, your functions can be used in other procedure components. For more information, see Define Function Wizard. HTML Composer. Creates reporting procedures and highly refined HTML pages where procedures can be run in a single process. For more information, see HTML Composer. Document Composer. Creates compound reports and coordinated compound reports in one integrated process. For more information, see Document Composer. Match Wizard. Creates logical expressions. For more information, see Match Wizard. Engine Tool. 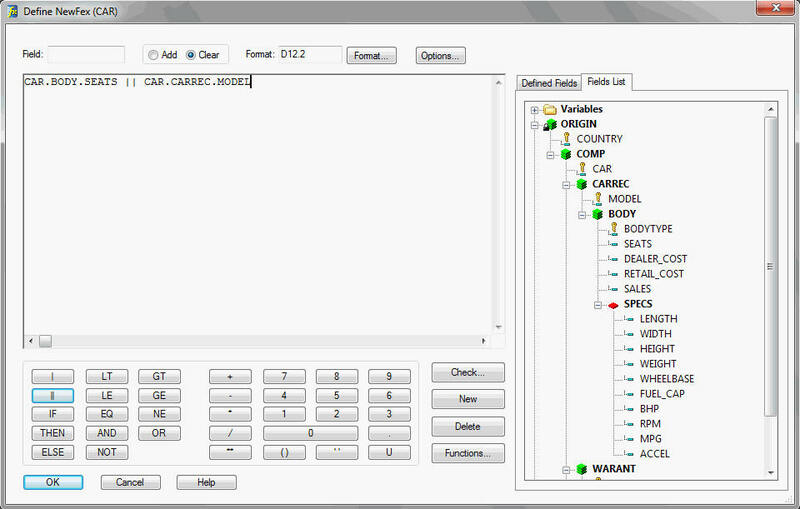 Exposes the FOCUS ENGINE SET commands and enables you to enter ENGINE commands or connection attributes, and override parameters. For more information, see Engine Tool. Dialogue Manager. Allows you to control the flow of your application with the use of variables. For more information, see Managing Flow of Control in an Application in the Developing Reporting Applications manual. Execute Wizard and Include Tool. Calls other procedures from the current procedure. For more information, see Execute Wizard and Include Tool. Dimensions Tool. Creates temporary OLAP hierarchies for a procedure. For more information, see Dimensions Tool. Developer Studio creates launch pages that prompt for values. HTML Composer. Creates reporting procedures and highly refined HTML pages from which the procedures can be run, in a single process. For more information, see HTML Composer. OLAP Control Panel. Manipulates multi-dimensional data for analysis. OLAP Selections Panel. Provides quicker ad hoc data selection, graph transformation, and drill downs on measures. For more information, see OLAP Graphical Tools. Deploy Wizard. Partitions and copies files to the specified Reporting Server and web server. You can only access this option from the Projects folder. For more information, see Deploy Wizard. Text Editor. Enables you to create, view, and edit source code for procedures, Master and Access files, and other types of project files. This tool is especially useful for writing code that does not have a corresponding graphical tool, such as Dialogue Manager code. For more information, see Text Editor. SQL Editor. Allows you to code SQL passthru and highlights any SQL commands within the code. For more information, see SQL Editor. Set Tool. Resets parameters to change aspects of WebFOCUS default behavior that affect both the local development and deployment environments. For more information, see Set Tool. Allocation Wizard. Assigns temporary names and storage locations to files created and used by WebFOCUS. For more information, see Allocation Wizard. Use Tool. Identifies a FOCUS data source. For more information, see USE Tool. Impact Analysis. Analyzes Master Files and fields and determine if they are used in WebFOCUS procedures. For more information, see Impact Analysis. Command Console. Enables you to issue commands to a Reporting Server. For more information, see Command Console. Reporting Server Console. Remotely manages your Reporting Server environment. You can view server and agent status and statistics and manage agent connections. For more information, see Reporting Server Console. The Project Wizard enables you to name the project, designate a directory for it, and optionally add other directory paths to data sources from which the project can retrieve information, or paths to other resources. When you have completed the Project Wizard, the new project is added as a node in the Explorer under Projects on localhost. For details about this tool, see Creating a Reporting Application in the Creating Reporting Applications With Developer Studio manual. The Synonym Editor enables you to view and edit existing synonyms. This tool generates the data description language required to read the data. The Synonym Editor supports hierarchical data and the Financial Report Painter uses this data to create a tree hierarchy. For details about the Synonym Editor, see Using the Synonym Editor in the Describing Data With Graphical Tools manual. For more information about the Financial Report Painter, see Creating Reports With Financial Report Painter in the Creating Financial Reports manual. Whether you are developing projects in the local server environment (the Projects on localhost area), or running procedures from the Data Servers area under WebFOCUS Environments, you will need to ensure that the Reporting Server has the data source descriptions or synonyms it requires to locate and interpret your data sources. You can create synonyms using the Create Synonym tool. You must configure a data adapter before you can create a synonym. You may configure adapters with the Create Synonym Tool. 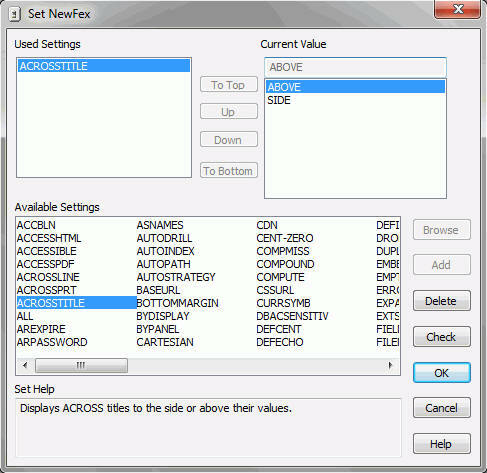 For details about this tool, see Accessing Data and Creating Synonyms in the Describing Data With Graphical Tools manual. For z/OS platforms, the Synonym Wizard is used to create synonyms when reporting against other remote servers (or subservers) that are configured on the target server. You can also create synonyms against DB2, the only relational data source supported on MVS. You can use the Synonym Wizard to create a synonym for a data source on the Reporting Server, based on the native schema that resides with the data. If the remote server is configured as a subserver to a hub server, the Synonym Wizard can generate a synonym on the hub server, including an Access File that identifies the location of the data on the subserver. The Synonym Wizard guides you through the creation process for one or more synonyms. The synonyms are created on the Reporting Server in the current application. The new synonym appears in the Master Files folder from which the wizard is launched. Note: For data sources, Web Query uses the original Master Files stored on the server, therefore no synonyms are required. The wizard consists of panels beginning with one shown below, where you select the relational data source you want to generate a synonym for. The Component Connector menu, which appears in the Procedure window, enables you to create components that make a procedure executable. A Comment component is displayed by default. A procedure can include one or a combination of components, as illustrated in the following window. Open the Component Connector toolbox by clicking one of the yellow diamonds. As you add components, the Procedure window displays an icon that represents the component. Each icon on the Component Connector toolbar launches either a graphical tool or the text editor. You can check components in order to locate errors. Each component tool includes a Check button that checks the syntax of the code against the server. The options available in the Component Connector menu are also available in the Task Viewer toolbar and in the Insert menu. For details about this tool, see Creating a Reporting Procedure in the Creating Reporting Applications With Developer Studio manual. Report Painter provides a graphical representation of the report you are creating. Include totals, subtotals, column calculations, heading, footings, and images. Add drill-downs to detailed reports and URLs. For details about these and many other features, see the Creating Reports With Report Painter manual. Drag the column border to the desired width. Add a border to an entire report, a column, or any object area (for example, Page Heading, Page Footing, Subheading, Subfooting). You can add borders in a variety of line styles, widths, and colors. Style the background color for an entire report, including all column titles and all data components. You can also specify a background color for individual columns and alternating rows. Apply a page color. The report on the page inherits the page color. Insert the current page number and total page count for a report as embedded fields in a report heading or footing. Insert a spot marker. A spot marker divides text in a heading or footing into separate items. You can then individually position and style these items. Align decimal points. You can align decimal points when the displayed data has a varying number of decimal places. Insert the current date. You can insert the current date as an embedded field in any object area (for example, Page Heading, Page Footing, Subheading, Subfooting) in Report Painter. Once the date is inserted, you can justify, position, and change the font of the date field. You can also specify the date format and a display format for the time. For more information, see Creating a Calculated Value With Report Painter in the Creating Reports With Report Painter manual. Select a column component (Title, Data, or Title and Data) and apply styling options (font and font color, grid, border, or background color), using the Style tab on the Field Properties dialog box. In addition, you can create a condition and apply to it any style available on the Style tab. Copy an existing drill-down component to a column component, using the Drill Down tab on the Field Properties dialog box. You can also open a child report from this tab for viewing or modification in a new instance of Report Painter. Remove an underline from a column title on a report, using the General tab on the Field Properties dialog box. Enter replacement text using the Features tab. The Features tab on the Report Options dialog box features a Report Title input field. The text you enter into this input field replaces the default text in the Internet Explorer title bar when you run the report in HTML format. For Excel report formats, you can enter a worksheet title in the Customize worksheet title input field of the Format tab. The text in the Customize worksheet title input field replaces the default Worksheet tab text in Excel 2000. Use the Range option in the Variable Editor dialog box. You can specify a range of values instead of a list of acceptable values when you access the Variable Editor dialog box. Use the Select Format option. The Report Options dialog box provides a Select Format drop-down list that enables you to specify output formats, such as HTML, HTML Table, AHTML, PDF, PS, Exl2K, Exl2K Formula, Exl2k Pivot, Exl97, Default, and User. Use shading patterns and scaling options to improve data visualization. Data visualization is supported for PDF and PS formats. Although the color option on the Data Visualization dialog box is the default for HTML, PDF, and PS formats, you can select different shading patterns for PDF and PS formats. The shading patterns make graphs in black and white reports more readable. There are two options for specifying relative bar graph scaling for multiple report columns under a common Across sort field to which data visualization is applied. Use the Uniform scale option if you want each vertical bar graph to be scaled based on the minimum and maximum values of all values compiled from each Across column. Use the Distinct scale option to specify that each vertical bar graph should be scaled based on the distinct minimum and maximum values for each Across column. Apply an external Cascading Style Sheet (CSS) to an HTML report. The Style tab features a Style File Selection button that allows you to apply an external Cascading Style Sheet to an HTML report. You can also assign a Cascading Style Sheet class to a report object in the StyleSheet. Report Painter enables you to create and style complex reports. You can graphically paint the report on the Report Painter window, which is a graphical representation of the report page. The graphical view provides a close approximation of how the report will display at runtime. To get a more WYSIWYG view, use the SET SQUEEZE=OFF command in your report or pin all of the columns of the report. For more information on setting these options, see WebFOCUS Creating Reports With Report Painter Version 7 Release 7 . Graphical User Interface (GUI). You can align embedded fields in object areas (Page Heading, Page Footing, Subheading, Subfooting) with report columns. Note: This feature is available only for HTML reports. Copy style characteristics from one column to other columns by using the Match All Styles button on the Font toolbar. You can copy font, grid, background color, conditional styling, or all of these characteristics. Launch procedure components from the Setup toolbar in Report Painter. The Setup toolbar lists the components that precede the report component. Click the component to access the appropriate tool (Define, Join, or Dimension). View the Master File structure (segments or fields) from the Fields tab in the Object Inspector. You can drag fields from this tab to the Report Painter window. If you drag a segment, all the fields in the selected segment are added to the report. View all the parts of the expression as you build it. With the Expression Builder, drag and drop the field in the expression and select the logical relation and comparison type from drop-down lists. Supports layering for the display of images with other report components. Tiles a background image instead of enlarging the image to fit the background. Allows you to save a report from the Save button on the General toolbar. The Save button saves all the components in the procedure, not just the report component. Allows a developer to assign a variable as the display format. This feature enables a user to select the report output format. Calculated trends and predicted values. You can calculate trends in data and predict values beyond the range of values stored in the data source with the Forecast feature. The Forecast feature uses averages, or a linear regression line, to distinguish trends and predict values. This is useful for predicting values that may occur beyond the current data set. Apportioned numeric data in tabular reports. You can group numeric data into any number of tiles (percentiles, quartiles, deciles, and so on) in tabular reports. For example, you can group student test scores into deciles to determine which students are in the top ten percent of the class. Grouping is based on the values in the selected vertical (BY) sort field and is apportioned as equally as possible into the number of tile groups you specify. Navigation of sort groups from a table of contents. You can add multiple BY fields to an HTML Table of Contents (TOC). In the previous release, you could only sort on the highest level BY field in a single request. With the implementation of this multi-level feature, the TOC option is available when you right-click any BY field in your report. For this feature to be useful, the report must contain at least one vertical sort (BY) field. If you include more than one sort field in a report, the hierarchy is determined by the order in which the fields are specified in the request. The TOC displays, as hyperlinks, all values of the first (highest level) vertical sort field, as well as the values of any lower level BY fields that you designate for inclusion. Unless otherwise specified in the request, a page begins when the highest level sort field changes. The TOC itself is an object that appears as an icon in the upper-left corner of the report, or as one or more drop-down lists in a heading or footing. Check button to run procedures against the default server. The Check button appears in the following tools: Define, Set, Use, and Allocation Wizard. When you click the Check button, the current procedure is run against the default server. A dialog box opens that displays the component's code, and either an error message or text stating that no error exists. The SQL Report Wizard assists you with SQL passthru, which allows you to execute SQL code that retrieves data from an RDBMS. You can use the resulting extract file in Report Painter. The supported engines are DB2, DB2 for AS/400, Microsoft SQL Server, Oracle, Sybase, and Teradata. The SQL Report Wizard is available throughout all development areas of Developer Studio: Projects, Data Servers, and Managed Reporting. When working in Managed Reporting, the tool enables administrators to use SQL in Standard Reports available in the Domain or use procedures that reside on the Reporting Server. The Graph Tool provides an easy way to transform almost any type of data into an effective graph that you can customize to suit your needs. Working through the tabs of the Graph Tool, you will see the many features available when creating a graph. Select a graph type. All of the basic graph types are offered (line, bar, pie or scatter) with many variations on each type. Select X-axis and Y-axis values. Add fields to your report to designate the values for the X-axis and Y-axis, and select a detailed or summarized display of data. Define parameters for your data. Include record selection criteria that your data must satisfy before being included in the graph. Apply drill-down capability and conditional styling. Drill-down to a more detailed report or a URL. Apply conditional styling to highlight specific data in a graph. Add headings, footings, and graphs titles. Add and position headings, footings, and graph titles. Create multiple graphs. Select a second horizontal (X-axis) category to generate multiple graphs. Multiple graphs can be displayed in an HTML table or merged into a single graph. Define graph properties. 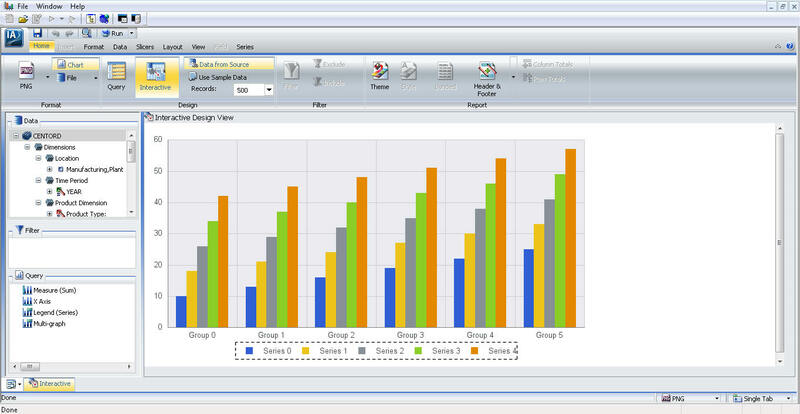 Define properties for the graph, legend properties, axis labels, graph colors, grid lines and other display elements. Display missing data values in a graph. Previously missing data was displayed as zero. You can display missing data as zero, a gap, dotted line to zero, or an interpolated dotted line. Customize the fonts in your graph. You can select the size, style, color, justification, and rotation for data and label text on the X- and Y-axis, legend text, and heading text. Temporarily hide the display of a Y-axis field. This is useful when you want to temporarily take out one field in the graph, while retaining all the properties of the current graph. Save graph output to multiple format. You can save graph output to PNG, SVG, GIF, and JPEG formats. The Graph Tool is available for local and server-based development. The Define tool enables you to create a virtual field as a component in a reporting procedure. A virtual field is evaluated on each retrieved record that passes any selection criteria on the real fields. Define the virtual field by assigning a format and typing an expression or composing it using the calculator and the fields and functions listed in the tabbed panes in the Define tool window. The result of the expression is treated as though it were a real field stored in the data source. When you click the Check button, the generated code is validated. A dialog box opens, displaying the component code and either an error message or text stating that no error exists. For details about this tool, see Creating Temporary Fields in the Creating Reporting Applications With Developer Studio manual. 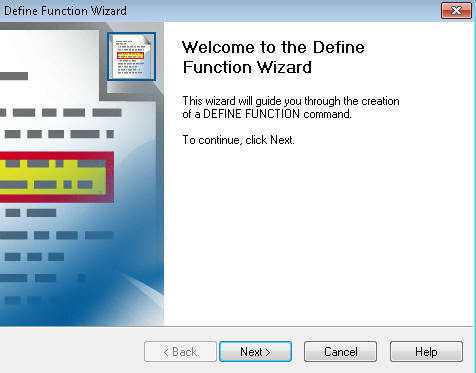 The Define Function wizard guides you through the process of creating a user function. The first screen of the wizard is shown in the following image. You can view the progression of the wizard through the images that are shown on the following pages. 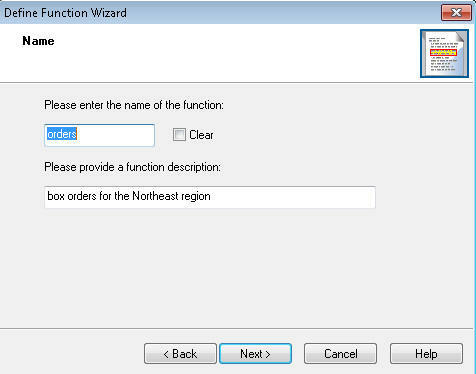 The Name section of the Define Function Wizard is shown in the following image. In this window, you supply a name for the Define function, as well as a description. 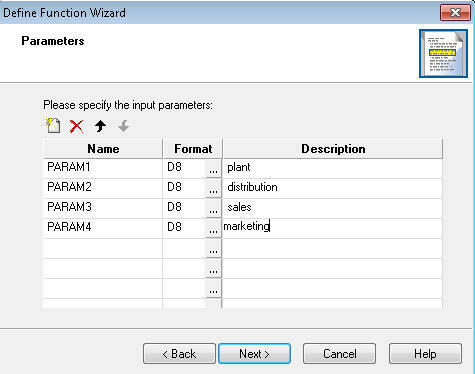 The Parameters section of the Define Function Wizard is shown in the following image. In this window, you specify the input parameters of the Define Function. You can rename the parameters, select a format type, and provide a description. 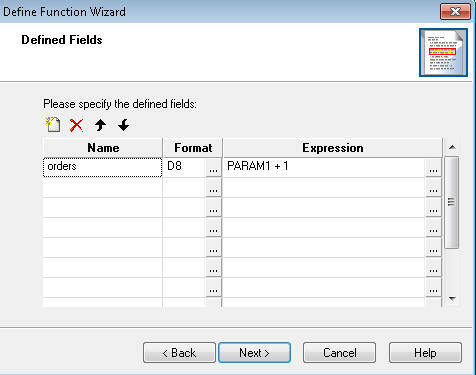 The Defined Fields section of the Define Function Wizard is shown in the following image. A defined field, with the same name as your function, appears. You can add multiple expressions to the Define Function. 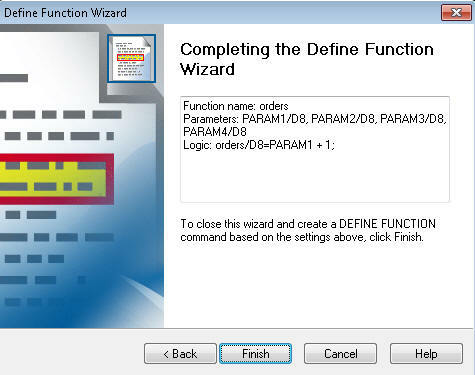 The Complete the Define Function Wizard window is shown in the following image. The function, as well as its parameters and logic, are shown in this window before completion of the Define Function. If you would like to create a graph, InfoAssist guides you through the best way to add a customizable graph to your report. For more information, see the WebFOCUS InfoAssist manual. The Set tool enables you to customize procedure development. It controls the way that reports and graphs appear on the screen or printer, the content of reports and graphs, data retrieval characteristics that affect performance, and system responses to user requests. It also helps you set up your metadata and manipulate information, such as dates. You can select parameters from a list in the Set tool, and apply an appropriate value. The tool provides the acceptable values for most of the parameters. The Check button replaces the Run button. When you click the Check button, the generated code is validated. A dialog box opens that displays a code for the component, and either an error message or text stating that no error exists. For details about this tool, see Customizing Your Environment in the Developing Reporting Applications manual. The Join tool provides a graphical method for creating and manipulating all types of Joins. You must specify a host file, then a cross-referenced file to create a join. The Join tool displays both files and ordinarily, a default Join. Dynamic joins. These joins connect two or more data sources that have two fields, one in each data source, with formats (character, numeric, or date) and values in common. The common formats ensure the proper interpretation of the values. This is sometimes called an equijoin, or inner join, since it is based on equality between fields. Joining a product code field in a sales data source (the host file) to the product code field in a product data source (the cross-referenced file) is an example of this type of join. Joins based on virtual fields. These joins connect a virtual field in the host file to a real field in the cross-referenced file. The fields being joined must have formats and values in common. This is another type of equijoin. Conditional joins. These joins connect two or more data sources based on conditions other than equality between fields. You can define Where criteria in an expression that determines how to relate records in the host files to records in the cross-referenced files. For example, suppose you have a data source that lists employees by their ID number (the host file) and another data source that lists training courses and the employees who attended those courses (the cross-referenced file). Using a conditional join, you could join employee ID in the host file to employee ID in the cross-referenced file to determine which employees took training courses in a given date range (the Where condition). Left Outer joins. Some rows in a host table may lack corresponding rows in a cross-referenced table. When a report displays all matching rows, plus all rows from the host file that lack corresponding cross-referenced rows, the join is called a left outer join. For details about this tool, see Joining and Merging Data Sources in the Creating Reporting Applications With Developer Studio manual. 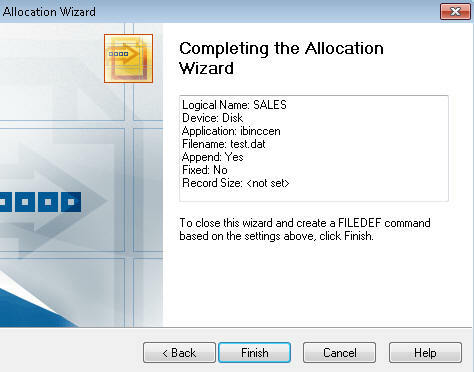 The Allocation Wizard enables you to create a FILEDEF command and generates platform independent file paths for all portable platforms by creating FILEDEF syntax with application names. Tip: Instead of including an allocation component in individual procedures, you can include all FILEDEF commands in a single file that you call with the Include tool at the beginning of each procedure. This enables you to make changes to your allocation assignments globally instead of changing the information in each procedure. For more information, see Execute Wizard and Include Tool. For details about the Allocation Wizard, see Assigning a Logical Name With the Allocation Wizard in the Creating Reporting Applications With Developer Studio manual. Tip: Instead of including a USE component in every procedure, you can create a USE directory by including all USE specifications in a single file, which you call with the Include tool at the beginning of each procedure that needs to access the USE directory. For more information, see Execute Wizard and Include Tool. The Check button replaces the Run button. When you click the Check button, the generated code is validated. A dialog box opens, displaying the code of the component and either an error message or text stating that no error exists. For details about this tool, see Accessing a FOCUS Data Source in the Developing Reporting Applications manual. You can use the Impact Analysis tool to analyze Master Files and fields and determine if they are used in WebFOCUS procedures. This tool helps developers determine how frequently a Master File or field is used and the impact that would result if you change the Master File. The Impact Analysis tool provides developers with a listing of all the procedures that are impacted. It can also interactively open procedures based on the results and make necessary changes. You can access this tool in the Explorer window of Developer Studio. The Execute Wizard and the Include tool enable you to call other procedures from the current procedure. The Execute Wizard allows one procedure to execute or call another procedure. The called procedure behaves as a completely separate procedure, with its own context. With the Execute Wizard, you can pass parameters directly from the user interface to the called procedure by automatically checking the called procedure for available parameters. If parameters are available, the tool will display the available parameters, allow you to provide values, and even test the called procedure. The Execute Wizard is available throughout all development areas of the product: Projects, Data Servers, and Managed Reporting. The following screen is the first window of the Execute Wizard. The Include tool allows one procedure to run another procedure as if the second one were embedded in the first. In this case, the procedure being included (called) has full access to variables defined in the calling procedure. Using this tool, you can create an object that includes another procedure within a host procedure. Note: Recursive includes can only be embedded up to four levels deep. For details about these tools, see Creating a Reporting Procedure in the Creating Reporting Applications With Developer Studio manual. The Dimensions Tool allows you to create a temporary OLAP hierarchy and dimensions. Unlike the Dimension Builder, this tool does not modify the Master File. Information is stored in the active procedure instead. You may access the Dimensions Tool by selecting OLAP Dimensions from the Component Connector toolbox. To create a hierarchy, drag and drop fields from the left pane into the Dimensions pane. Build an HTML page. The HTML Composer enables you to add push buttons, hyperlinks, and other objects that launch other WebFOCUS reports in your application. Create an HTML page for one or more reports that contain parameters. Create a complete report by adding multiple reports and graphs into a single HTML formatted report. Directly edit an HTML page in the HTML Editor or in a third party editor. When you open the HTML Composer, it appears as shown in the following image. For more information about the HTML Composer, see the Designing a User Interface for a Web Application With the HTML Composer manual. Document Composer enables you to design reports, and to coordinate and distribute layouts made up of multiple reports and graphs in a single document. When creating compound reports from Document Composer, PDF, HTML, active reports, PowerPoint, and Excel are available as output formats. When you open Document Composer, it appears as shown in the following image. Note: To include a graph in Document Composer, the graph must be saved in .svg format. For more information about Document Composer, see the Creating Compound Reports With Document Composer manual. Developer Studio provides a fully integrated text editor that you can use to create, view, and edit the source code for procedures, procedure components, Master and Access files, and other types of files required by your projects. The text editor enables you to use familiar Windows editing techniques, such as cut, copy, paste, undo/redo, and drag-and-drop. When you open a Master File, procedure, or HTML file in the Editor window, syntax elements in the text appear color-coded for easy viewing and editing. For example, the keywords in a procedure appear in red. You can change default colors or remove text coloring to suit your preferences. For details about this tool, see Editing Application Components as Text in Developer Studio in the Creating Reporting Applications With Developer Studio manual. The primary location from which you perform OLAP analysis is the report itself. Any changes you make are instantly applied. You can sort measure values in ascending or descending order, drill down on measures and dimensions, change sort fields from vertical (BY) to horizontal (ACROSS), add a column of data visualization graphics to track trends, and display a bar graph in a separate pane above the report. In the Selections pane, you can change the selection criteria in your report for quick iterative analysis. A drop-down list is available for each dimension. You can multi-select values from one or more dimension lists to refine your report output, display or hide columns, drill down on and apply data visualization graphics to measures, drag and drop dimensions to the report frame, and present data in several graph formats. In the OLAP Control Panel, you can perform many functions that can also be accomplished from the report or the Selections pane, as well as several unique functions. You can sort dimensions in ascending or descending order, group data in tiles (for example, percentiles or quartiles), define selection criteria based on existing characters, ranges, and dates, stack measures to limit column widths, and save OLAP reports in PDF and Excel 2000 formats. In Managed Reporting, users can also save OLAP output in the My Reports folder. The following example shows how these controls look when the selections panel is positioned above the report and adjacent to the Control Panel. In the following example, the Control Panel is closed to maximize the screen space available for your analytic comparisons. For details about these tools, see Analyzing Data in an OLAP Report in the WebFOCUS Online Analytical Processing (OLAP) manual. Developer Studio provides an SQL Editor that enables you to code SQL Passthru and highlights any SQL commands within the code. This editor also allows you to choose your connection engine and connection name from drop-down lists on the toolbar. The supported engines are DB2, DB2 for AS/400, Microsoft SQL Server, Oracle, Sybase, and Teradata. The SQL Editor provides you with the option to select another engine. Note: If you choose the Other option, you must know the correct syntax to use for the engine name. The SQL Editor also provides you with the option of preparing an SQLOUT file, which you can use with Report Painter or Graph Tool. The SQLOUT file is a temporary file that you can select when you invoke Report Painter and Graph Tool. 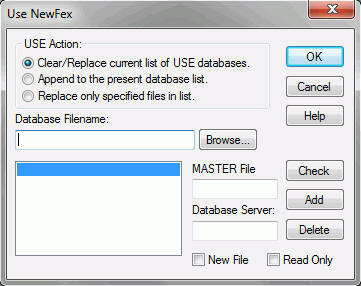 It is placed in the Hold Files area of the Open (Master Files) dialog box. To access the SQL Editor, open the Procedure Viewer and click the SQL Editor icon on the Component Connector toolbar. You can also access the SQL Report icon in the Setup area of the Report Painter Object Inspector to modify existing procedures. After you create, test, and debug a project in the development environment, you are ready to make it available as a live application on the web. This process involves moving certain project files to selected target servers in a WebFOCUS environment. Developer Studio automates the process for you. Multiple deployment scenarios. You can define multiple deployment scenarios and save them for future deployment. A deployment scenario includes the partitioning of the project files and the selection of servers. For example, you might have two deployment scenarios for a project: one that maps the files to a production server, and another that maps the files to a test server. Consolidated deployment tool for Developer Studio and Maintain. The Developer Studio and Maintain environments have a consolidated deployment tool. Deployment to multiple servers. You can deploy your project files to multiple WebFOCUS Reporting or Maintain servers. This enhancement enables you to access data on multiple servers, run your report components in the most suitable environment, and speed up your application processing. It also enables greater control of access to your reporting applications. This feature is relevant if you develop WebFOCUS reporting applications or WebFOCUS Maintain applications, and are responsible for deploying your application to end users who access it from a web browser. You can create more than one deployment scenario for a project, and you can view and modify the properties of an existing scenario. Developer Studio supplies a deployment scenario named Local Deploy, which it uses to prepare files to run on a local server. Do not modify or remove Local Deploy. You must enter and select appropriate information in the New Deployment Scenario dialog box to create a new deployment scenario. For details about this tool, see Partitioning and Deploying Project Files in the Creating Reporting Applications With Developer Studio manual. The Command Console enables you to send commands directly to a server from Developer Studio. This benefits users who have worked with Information Builders products and are already familiar with the command syntax. The Command Console sends output to your web browser. Output can include error messages, responses to query commands, and report output. If you open the Command Console before you run a procedure, it will also serve as a troubleshooting and debugging tool. For details about this tool, see Using the Command Console in the Developing Reporting Applications manual. The Reporting Server has the capabilities of a regular Reporting Server, and its configuration procedures are identical. Reporting Servers can be configured and managed through Server Consoles that use WebFOCUS technology. For a full understanding of configuration options and server capabilities see the Server Administration for UNIX, Windows, OpenVMS, OS/400 and z/OS manual. View server and agent status. View server and agent statistics. If your Reporting Server is secure, WebFOCUS prompts you for your user name and password. Note: When launching this tool from the main toolbar, or selecting Reporting Server Console from the Command menu, the console for the project development server will open. Depending on the type of project development you are performing (local or remote), the corresponding local or remote Reporting Server Console will open. Also, when working in the WebFOCUS Environment area of the Object Explorer, and the Data Servers area is opened, an icon is enabled in the Object Explorer Toolbar. When a data server is accessed, this option is enabled to allow users to open the Reporting Server Console for the selected server. This is supported on Windows, UNIX, and USS platforms. The Engine tool in Developer Studio exposes the FOCUS ENGINE SET commands and enables you to enter ENGINE commands or connection attributes, and override parameters. Note: The Engine tool is only used to create ENGINE statements. You are responsible for having the knowledge of the ENGINE SET command or the Connection Attribute needed. For more information about this tool, see the Creating Reporting Applications With Developer Studio manual. You can merge two or more data sources, and specify which records to merge and which to sort out, using the Match Wizard. The wizard creates a new data source (a HOLD file) into which it merges fields from the selected records. You can report from the new data source and use it as you would any other HOLD file. The merge process does not change the original data sources. You select the records to be merged into the new data source by specifying sort fields in the Match Wizard. You specify one set of sort fields (using the BY phrase) for the first data source, and a second set of sort fields for the second data source. The Match Wizard compares all sort fields that have been specified in common for both data sources, and then merges all records from the first data source whose sort values match those in the second data source into the new HOLD file. You can specify up to 32 sort sets which includes the number of common sort fields.